Tata Consultancy Services (TCS) has played a stellar role in helping the Tatas to become the first private business group to enter the Rs 10-trillion market capitalisation league. This has happened because of the double-digit rally in the TCS share price in the current year. Shares of TCS, the most valuable Indian company, on Friday closed at a lifetime high of Rs 3,406. At the current price, TCS is valued at Rs 6.52 trillion, or $98.52 billion, a whisker away from the $100-billion mark. The 27 listed companies of the Tata group now have a combined market capitalisation of Rs 10.7 trillion, up 11.2 per cent during the current calendar year. The group companies had a combined market capitalisation of Rs 9.6 trillion at the end of December 2017. Mukesh Ambani-owned Reliance Industries is ranked second on the league table with the group companies’ combined market capitalisation of around Rs 6 trillion. If Tata group companies were listed as a single holding company, the group would be the world’s 49th most valuable conglomerate with a market capitalisation of $162.2 billion — behind French oil and gas major Total SA and ahead of Anglo-Dutch consumer products major Unilever Plc. TCS is set to enter the league of the world’s 100 most valuable companies. Currently, TCS is ranked 103, ahead of British pharmaceutical company GlaxoSmithKline (GSK). Interestingly, the rupee has come off by 1.7 per cent in the past two weeks from 65 to 66.11 against the greenback. If not for the weakness in the rupee, TCS’ market cap would have breached the $100-billion mark. Reliance Industries had crossed the $100-billion mark a decade ago. Back then, the rupee traded at only 40 against the dollar. In domestic currency terms, TCS’ market cap is the highest for an Indian company. TCS shares have gained 26.4 per cent during the year so far, against 1.2 per cent rise in the benchmark BSE Sensex index during the period. The information technology (IT) major now accounts for 61 per cent of the Tata group companies’ combined market capitalisation, up from 53.8 per cent at the beginning of the current calendar year and 59 per cent at the beginning of 2016. 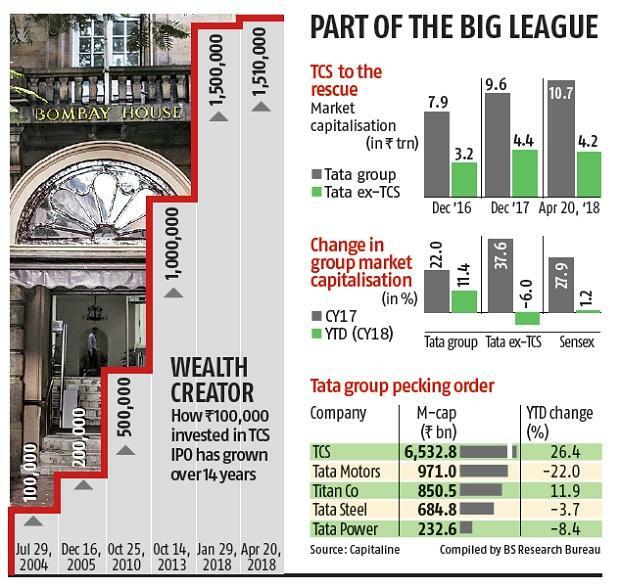 Among large group companies, TCS is the single-biggest contributor to the incremental growth in the Tata group’s market cap, followed by Titan Company and Indian Hotels. Excluding TCS, Tata group companies’ market cap was down 6 per cent during the year so far. TCS’ market capitalisation is up by Rs 1.36 trillion during the year so far, against a net addition of Rs 1.1 trillion in the group market capitalisation since the beginning of the year. In comparison, Tata Motors, Tata Steel, Tata Power, Voltas and Tata Global Beverage saw a decline in their share price and market capitalisation. Experts attribute this to TCS’ relatively better financial performance and various headwinds affecting key companies in the group. “TCS has gained from the shift in investors’ money to defensive IT stocks as companies in other sectors such as automobiles, metals and power face headwinds from high debt, currency volatility and poor industrial growth in the country,” said G Chokkalingam, MD, Equinomics Research & Advisory Services. “Large IT companies look relatively better than manufacturing and industrial companies as they are debt free unlike manufacturing and industrial companies and are net beneficiaries of rupee depreciation,” he added. TCS’ revenues were up 8.2 per cent year-on-year (y-o-y) during the quarter ending March 2018, while net profit was up 4.5 per cent y-o-y during the quarter, ahead of street expectation of low single digit growth in top line and bottom line during the quarter. In comparison, TCS’ revenues and net profit grew at a compounded annual growth rate of 13 per cent and 11 per cent, respectively, during three year ending March 2017.